To learn more about Western's graduate programs, visit wiu.edu/graduate_studies. General information about WIU can be found at wiu.edu/about. 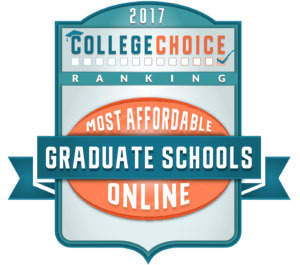 MACOMB/MOLINE, IL -- Western Illinois University is the only Illinois public university to be ranked in the top 15 among 50 of the most affordable online master's programs in the nation by College Choice. WIU, ranked 11th, is one of two Illinois public universities appearing in the 2017-2018 College Choice rankings. According to College Choice, the 50 colleges and universities range in size and specialty, but they share one thing in common: the lowest cost per credit hour for online graduate education. Not only are these the most affordable online graduate degrees in the country, some of these schools are also the best, with regional, national and global rankings, CollegeChoice.net stated. The data used for the rankings comes from PayScale, U.S.News & World Report, the U.S. Department of Education and university/college websites. Last month, College Choice recognized the WIU School of Nursing as a 2017 Best Online RN to BSN Degree Program. Western was among two Illinois public university nursing programs ranked in the top 50 in the nation. In March, the independent publication also recognized WIU as a 2017 Best Online College in Illinois. Western, which is number four on the list, was among eight Illinois public universities ranked in the top 23 as a Best Online College. In August 2017, BestColleges.com recognized the Top 20 Best Online Accredited Colleges in Illinois, and Western Illinois University is among the best of the best for providing students with a variety of degree programs online. Western is one of six Illinois public institutions appearing on the Top 20 Illinois list. WIU offers 463 online classes (320 undergraduate; 143 graduate) and seven undergraduate and graduate degree programs, including the longstanding Bachelor of Arts in General Studies (BGS), which offers students the option of obtaining their degree entirely via distance learning opportunities, or through a combination of on-campus and distance learning classes. For more information about Western, visit wiu.edu/admissions. For more information about online education opportunities at WIU, visit wiu.edu/online_learning.